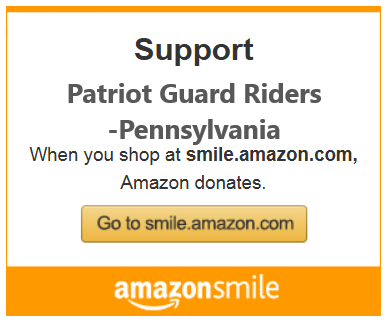 Patriot Guard Riders-Pennsylvania (PGRPA) is a 100% volunteer, federally registered 501(c)3 non-profit corporation. Patriot Guard Riders, Inc. (National) Help on the Homefront (HOTH) is an initiative conducted and supported by the National organization and is supported by PGRPA. Any and all logos, tag lines or other materials associated with, or utilized by PGRPA to promote the organization, or any of its program initiatives are considered to be trademarks representative of PGRPA. Use of PGRPA logo(s) is authorized to PGRPA volunteers and members SOLELY for personal use, and on any social media platform. Through its use on social media platforms, the individual assumes all liability of their posts and verbiage is of their own, and does NOT speak on behalf of PGRPA in any instance or through any re-post. When expressing personal opinions on social media sites and can be identified as a PGRPA volunteer or member, it should be made very clear that you are speaking for yourself and not on behalf of PGRPA. If you violate federal or state laws through inappropriate personal online activity, or any other form of communication, you are subject to removal from PGRPA. PGRPA logo(s) use on a “business card” for instances of introducing one’s self as a PGRPA volunteer or member is authorized, so long as it is not comingled with a business name. Its use is NOT authorized to garner profit for any individual, nor is it authorized to promote any business. Use of any trademarked material of PGRPA or any PGRPA initiatives in any manner whatsoever must be approved in writing prior to use. Once the proper approval has been obtained, the all of the following guidelines for use of PGRPA logo(s) or trademarked materials must be adhered to. When PGRPA is to be the beneficiary or recipient of proceeds or donations resulting from a non-PGRPA sponsored or conducted event (i.e. PGRPA is not the host, presenter or sponsor of the event), the event should be promoted as “Benefiting Patriot Guard Riders-Pennsylvania” or “proceeds from this event will benefit Patriot Guard Riders-Pennsylvania, Inc.”. All marketing or promotional material for the event or promotion must reflect Patriot Guard Riders-Pennsylvania as a beneficiary. Creation of websites, social media pages, or the like with any combination of the words ‘Patriot Guard Riders-Pennsylvania’, ‘PGRPA’, ‘PGR’, etc. is not permitted, nor are any of PGRPA’s logos or other trademarked materials to be used as a representative image profile picture, header image, etc. Once approved for use, only master artwork will be used when reproducing the Patriot Guard Riders-Pennsylvania logo(s) or other trademarked information. Always ensure that you are using the correct artwork for which authorization by PGRPA has been given. Logos or other trademarked information should not be taken from any PGRPA website or any internet pages. PGRPA reserves all rights to accept or reject final usage of the logo or any other non-authorized files including website, social media, etc. To obtain PGRPA logo or trademarked information files, please complete the Contact Us form. Permissions are required for any and all use of this material. Upon a mutually agreed activity, we will provide the entity seeking permission high quality artwork of Patriot Guard Riders-Pennsylvania logo(s). If you have any questions on the above information, please call at (724) 4-PATRIOT / (724) 472-8746 or email the State Captain at [email protected].